Newcastle-Upon-Tyne, or just Newcastle, as it is more commonly known, has developed from an industrial city into a thriving metropolis. Successfully regenerated, Newcastle has now become a highly popular UK weekend destination, particularly with a younger crowd who flock to its bars, restaurants and nightclubs. A compact city with plenty to do, Newcastle is friendly to tourists and teeming with history and culture. 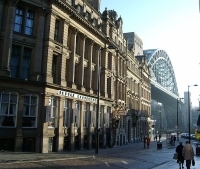 Situated on the River Tyne's north bank, the city boasts a 2,000-year history and a treasure-trove of architecture, with some of the most classically-styled buildings found anywhere in the UK. Although Newcastle really only reached prominence during the Industrial Revolution, it had long been a capital and a chief defensive point in the north of England for the Romans and Saxons respectively. The city's origins as a Roman town are still evident in Hadrian's Wall, the ruins of which can be seen stretching eastward to Wallsend. Today, these Roman ruins and the grand elegance of areas such as the neoclassical Grainger Town in the city centre contrast with the ultra-modern buildings of the city's new Quayside development. Newcastle's waterfront features chic boutiques, excellent restaurants, stylish hotels and modern art. The Gateshead Millennium Bridge, a work of art in itself, arches across the River Tyne to link Newcastle to the Gateshead Quays.